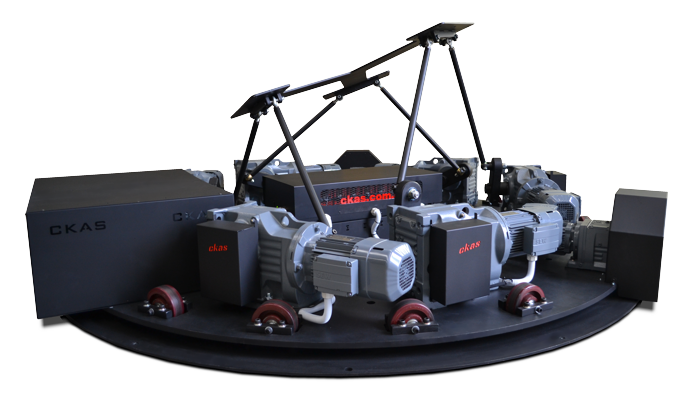 The CKAS “WR” series motion platforms / systems are the World's first and only 7DOF "Continuous Rotation" electric motion systems available off the shelf for immediate drop in to any simulator design - a full motion 6DOF mounted on an infinite turntable. These leading edge motion systems offered by CKAS Mechatronics are 7DOF electric, high fidelity synergistic motion platforms / systems, with a very unique feature - they have the ability to rotate continuously on the 7th axis, to allow correct and proper rotation cues. These units are the “only” solution for any motion simulator application requiring genuine ground handling such as true car, truck or aircraft ground handling applications, providing more reliability, performance and features than any other motion system on the market. With ample room to carry on board 4 x High End Rack Mounted computers (PC's not included) allows a simulator manufacturer to carry on the rotating platform more than enough computing to create a high fidelity simulation. The advanced rotation system allows the pass through of Ethernet, a huge 80 amps of power (up to 45 Amps for the user installed equipment on the W15R) and 4 general digital I/O to the rotating platform from the outside world. The special design of this system has been created with high end OEM simulator builders in mind. CKAS 7DOF Motion Platform units have been developed under the most stringent academic and professional design guidelines, to offer the highest fidelity motion systems, for the highest demand applications, at the best value. The key difference between CKAS 7DOF motion platforms / systems and other units on the market, is “design intent”. The CKAS units have been engineered specifically to be used as “Ground Interaction Simulators” and "Disorientation Training / UPRT Simulators". This means that our washout algorithms, our controller architecture, and our mechanism design have all been refined to create the highest fidelity possible at an incredible value price point. CKAS 7DOF motion platform units are the ONLY electric crank arm motion systems in the world which have been awarded “Full Flight Simulator” credits on the revolutionary CKAS MotionSim Series (Full Flight Trainers), and our academically developed washout cueing algorithms are the key to these awards. Of course, this doesn’t mean that the CKAS 7DOF motion platform units cannot be used in ride applications. On the contrary, these units offer the best performance / cost ratio available from any other units on the market, and the resultant customer experience is second to none. As with all revolutionary products, CKAS are providing more performance, for lower cost, and extremely limited maintenance requirements, making the CKAS 7DOF motion platforms perfect for ANY application. If an application is to have the highest fidelity and the most realistic motion sensation, the CKAS “WR” Series 7DOF motion systems are by far the best value alternatives on the market.